Tom runs his eyes over the fantasy relevant rucks and utilities from this year’s draft crop. As we turn our eye to Fantasy 2019, Tom has been looking at all of the draftees throughout the season and shares his watch-list for the upcoming season. Today he profiles a couple of ruckman and utility prospects to keep an eye on over the pre-season. Kieren Briggs is the clear standout Ruckman from the draft class of 2018. After missing out last year, the 19 year-old starred for the GWS Giants in the Academy Series before enhancing his status as the premier ruckman on the big stage with the Allies at the division one championships. Already well-developed physically at 98kg, Briggs’ arrival comes at a time where the Giants ruck department appears thin – especially for a now-annual finalist and top four candidate. Whilst he won’t win the grand final sprint any time soon, Briggs runs out games well, applies excellent defensive pressure and featured for the GWS NEAFL side during the season. Briggs averaged 13 disposals, 4.8 marks, 5.8 tackles, 24 hit-outs, 0.8 goals and 100 fantasy points per game for the Allies – extremely strong statistics for a player of his size. Whilst Briggs may have been regarded as the best overall ruck prospect, Central Districts Darcy Fort would make a strong case as the best state-league big man. Fort was a star in the SANFL for the Bulldogs in 2018, averaging 104 points from his 13 matches, with his ruck dominance (average of 31 hit-outs) ensuring his midfielders got first use. Also capable up forward, Darcy Fort is again not quick, but agile and mobile for a 204cm ruck. He will provide Geelong with back-up ruck depth and appears behind the likes of Zac Smith and potentially Ryan Abbott, but is ready to go if required. 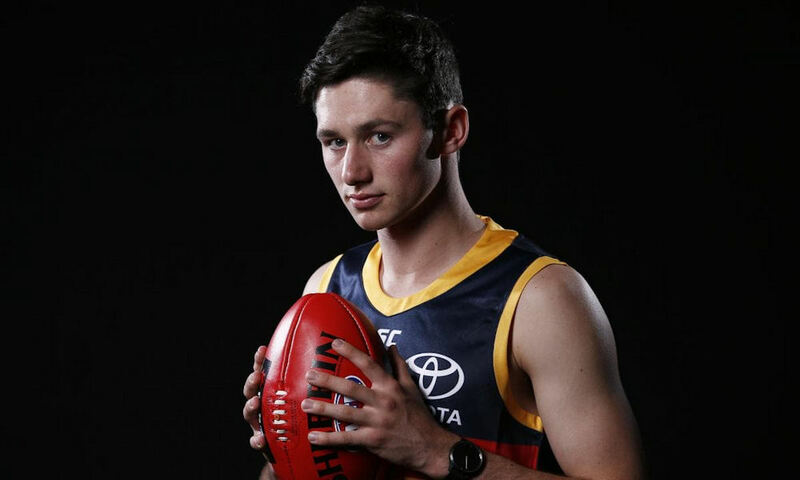 Chayce Jones was Adelaide’s first selection in the 2018 National Draft, taken with pick 9 overall. After suffering a bad foot injury last season, Jones returned with a bang in 2018, averaging 21 disposals, 3.5 marks, 6.5 tackles and 97 points in four Allies games. Like fellow draftee and Crows teammate Ned McHenry, he is not the tallest but a fierce ball winner and aggressive tackler. Athletically, he has it all covered, registering impressive results for the running leap (91cm), 20m sprint (2.97 seconds), agility (8.27 seconds), yo-yo test (level 21.3) and 2km time trial (6.06 minutes), whilst also ranking highly in the kicking test. It’s no secret, he’s my personal favourite player in the draft pool and I was wrapped when the Crows secured the Tasmanian. Jones’s aerobic capacity and versatility will hold him in good stead to contend for a debut next season. Although it appears as if he will be deployed in the midfield for the majority of his career, Chayce may spend the first couple of seasons as either a running half-back (potentially allowing Smith and Milera to advance further up the ground), on a wing or as a small pressure forward. He can do it all this boy. The speedy Gippsland Power captain demonstrated excellent leadership skills in 2018, capping off a strong year with selection in the TAC Cup Team of The Year. Durrsma still requires a number of pre-seasons spent toiling away in the gym, however he is a solid all-round athlete and ranked above-average statistics wise in 2018. He averaged 18 disposals, 4 marks, 4 tackles and 81 points, splitting his time between half-back and the midfield. Port Adelaide selected three highly skilled utility-type players with their early selections, and Duursma is certainly one to keep an eye on if the Power view him as filling a void off the back flank, having maintained his high ranking through the course of the season. Bailey Scott entered the year faced with a unique decision to make. He could have nominated to join the Cats, where his father Robert played. Scott, part of the Gold Coast Suns Academy, could also have stayed in Queensland and joined the young club via the Academy rule. However in the end, he chose North Melbourne, who gladly matched a rival bid, selecting him at pick 49. He represented good value at this mid-draft pick, having been ranked considerably higher by most draft pundits. Scott is a well-balanced utility capable of playing at either end of the ground or in the middle. He has strong football IQ, hits the scoreboard and uses the ball well by hand and foot. However his production during the year is perhaps Scott’s most appealing factor – at least for fantasy coaches – having averaged a well-rounded 23 disposals, 4.8 marks, 4 tackles, 1.3 goals and 94 points per game. Scott’s endurance and versatility should see him in the mix to feature for the ‘Roos in 2019 as they look to return to finals. Lukey English was easy to spot running around for Western Australia at the National Championships, sporting a helmet made famous by Caleb Daniel and Andrew Brayshaw. Not only did his helmet help him standout, but his ability to collect the football saw him pop up all over the ground. English averaged 23 disposals, 4.3 marks, 5.5 tackles, 0.8 goals and 96 points for WA, ranking him one of the best fantasy prospects at the National Championships. Able to run all day on the inside and outside of a midfielder, thanks to a high endurance base, English’s knocks are his lack of speed and a low impact per possession. However those two areas don’t reduce fantasy scores! Although it will be tough to break into the Tigers side, could English replicate what Jack Graham did in 2017? Briggs vs Flynn. Who gets the game time for GWS back up ruckman now that lobb has been traded?